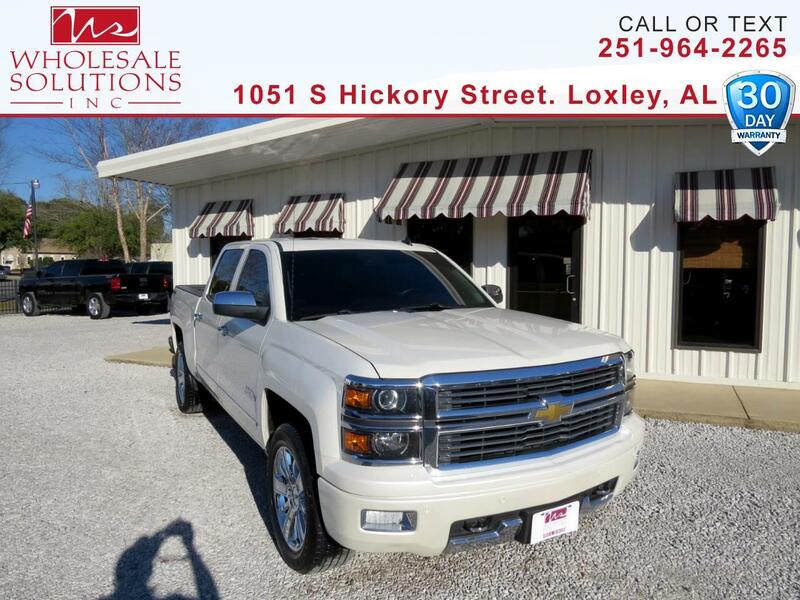 Used 2014 Chevrolet Silverado 1500 4WD Crew Cab 143.5" High Country for Sale in Loxley AL 36551 Wholesale Solutions Inc.
CARFAX One-Owner. *** DEALER WARRANTY ***, ***Financing Available***, *** MANUFACTURE WARRANTY ***, Navigation, *** Nice Truck ***. Buy with confidence at Wholesale Solutions with our 30 Day or 1000-mile, whichever comes first Power Train limited Warranty. Vehicles over 125,000 miles are excluded from this warranty and are sold as is. See our website, Vehicle Disclaimer for full details. This vehicle is located at our Loxley location. You can Call or Text us at 251-964-2265. You can Call or Text us at 251-964-2265. Wholesale Solutions has been selling quality Pre-Owned Trucks. Cars, and SUV’s in the Gulf Coast since 2007. We are located in Loxley Alabama at 1051 S. Hickory Street. Our goal is to make your purchase simple and straight forward. Working with our customers is the key to our success. Our customers love us because we do it right. We will help in any way we can with getting you into the vehicle you are looking for. We offer financing through a large selection of banks and Credit Unions, this getting you a great rate and payments that will meet your budget. We take great pride in how clean we get our vehicles. We go through great lengths on making sure the vehicle is correct and ready for a new owner. We love trade-ins, we will always offer a fair price. We also take in trades on RV’s, Boats, Tractors, and most any type of vehicle. Radio: AM/FM Stereo w/8'' Diagonal Color Touch Nav. Vehicles over 125,000 miles are excluded from this warranty and are sold as is. This warranty includes all internally lubricated parts of the motor and transmission. The work, under this warranty, must be done by Wholesale Solutions and be within 30 days of the purchase of the vehicle or the first 1000 miles, whichever may come first. Wholesale Solutions will use a labor rate of $98.00 per hour. Vehicles over 125,000 miles are excluded from this warranty and are sold as is. WHAT PARTS OF THE VEHICLE ARE COVERED BY THE LIMITED WARRANTY? If a malfunction, defect, or failure occurs in a covered part listed below, Wholesale Solutions will repair or replace the covered part under the warranty program. * All features and options listed are descriptive of what can be expected on the vehicle. Actual options should be verified by the customer and dealer. Price may exclude tax, title, tags, government fees, and any finance charges (if applicable). Please contact this dealer to confirm that this vehicle is still available. Current mileage may vary due to test drives and vehicle relocation. All the information on this website is published in good faith and for general information purpose only. http://www.wholesalesolutionsinc.com/ does not make any warranties about the completeness, reliability and accuracy of this information. Any action you take upon the information you find on this website (http://www.wholesalesolutionsinc.com/), is strictly at your own risk. http://www.wholesalesolutionsinc.com/ will not be liable for any losses and/or damages in connection with the use of our website.